Review The ST1000 was Samsung’s first Wi-Fi enabled camera that not only allowed users to e-mail pics from a hotspot, but had GPS thrown in just to prove you were really there. With the SH100 wireless compact, the company goes beyond snap and share by offering tight integration with its top tier Android products enabling tethering with a compatible handset or tablet, so that it becomes the SH100 viewfinder for remote capture. 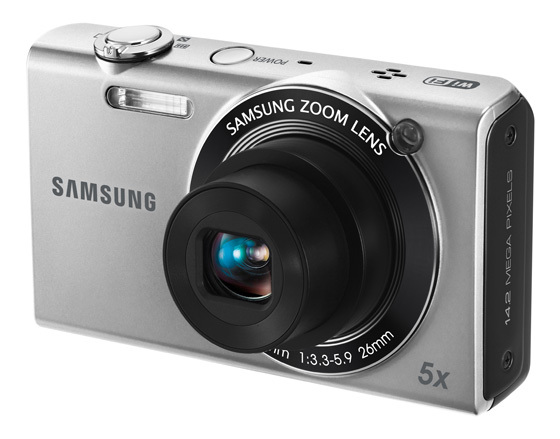 The SH100 sports a 14.2Mp sensor, 3in touchscreen and a 5x optical zoom with the 35mm equivalent of a 26-130mm lens. It can handle 720p HD video recording and has an ISO range between 80 and 3200. At 93 x 54 x 19mm and 110g, the SH100 is highly pocketable and designed to operate as closely to an Android phone as possible. Despite its compact dimensions the SH100 offers a secure and comfortable hold, partly due to the slightly canted top plate that allows a more ergonomic position for pressing the shutter. This, and the generous front space, coupled with the two ridges placed the back provide some sort of grip. The SH100 has little in the way of physical controls. Other than the shutter, surrounded by the zoom lever, the only other controls are a power button located on the left of the shutter; a Playback button immediately below the shutter and a Home button on the rear bottom corner of the camera giving access to the touch screen app-like menu that controls all settings, modes and operations. The look and feel of the SH100’s touchscreen navigation is akin to TouchWiz interface found on Samsung's Galaxy smartphones. The menu is arranged in large, square-shaped icons occupying four menu pages scrollable with a swipe of your finger and covering everything from shooting modes, settings and editing, to playback options, special effects and its many wireless features. These icons work exactly like phone app icons each giving access to a specific screen with its own ad-hoc set of virtual buttons and menu. Navigation is fairly straightforward and the icons are colourful and self-explanatory but the touchscreen technology is not nearly as responsive as that of a smartphone. I found myself having to press an icon several times before getting a response, sliding motions are sometimes not recognised and scrolling through pictures in Playback mode is an arduous task for your fingers. Worst of all, the camera was prone to freezing. However, a recent firmware update appears to have sorted that out, but alas not the inconsistent touch response.